It's the project's fourth major release so far this year. Tails is a Linux distribution most famously used by Edward Snowden. Boot Tails from a live DVD, USB drive, or SD card and it will turn any PC into a more private and anonymous system. Tails forces all network activity to go through the Tor network, preserving anonymity and bypassing Internet censorship. Shut down your computer and the memory will be wiped, with no trace of the Tails activity left on the system. This important Linux distribution has been advancing steadily with release after release since I last covered it with the release of Tails 1.4. The project just released Tails 2.4 on June 7, 2016. Tails 2.4 is an important release that fixes many security issues in the Tor Browser—which is based on Firefox—and other system components. 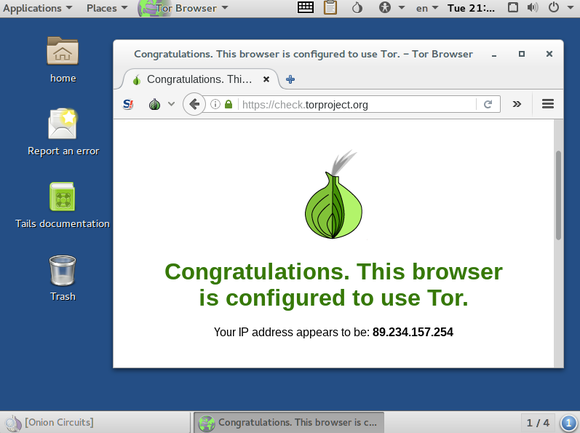 The Tor Browser has been updated to version 6.0.1. Icedove—the unbranded version of the Mozilla Thunderbird email client—was improved to only rely on secure protocols when automatically configuring your email account. Tails plans to share these improvements with Mozilla. There’s the usual raft of useful smaller changes, too. The Linux kernel and firewall have been hardened for more security, graphical libraries were updated for better hardware support, and more printers should work. The interface was tweaked a bit, with minimize and maximize buttons always appearing in title bars and the GNOME Tweak Tool desktop tweaking tool and Hledger accounting software removed from the default system. Read the full release notes for more details. Tails ensures that all your network activity is sent over Tor. The Tails project releases new versions frequently. The next release, Tails 2.5, is already scheduled for August 2, less than two months away. There have been quite a few notable changes since Tails 1.4, aside from the usual security updates, version bumps, and low-level tweaks. Tails 1.5 entirely disabled access to the local network in the standard Tor Browser. There’s a clearly marked “Unsafe Browser” for accessing the local network without your communications going through Tor. Tails 1.7 added the Icedove email client, based on Mozilla Thunderbird. This replaced the old Claws Mail client. It also allows booting Tails entirely in offline mode, with networking disabled. Tails 2.0 saw a huge change, moving the entire operating system to be based on Debian 8 Jessie under the hood. Tails also switched to the GNOME Shell desktop environment, with much newer versions of included GNOME utilities and other applications. Tails 2.2 added support for viewing commercial, DRM-protected DVDs without installing any additional software. It also added a new “Onion Circuits” dialog for viewing Tor routing information. The Tails project shows just how valuable Linux distributions and open software software are. Creating a project like this just wouldn’t be possible with Windows. Head to the Tails website for installation instructions if you’d like to give it a spin.